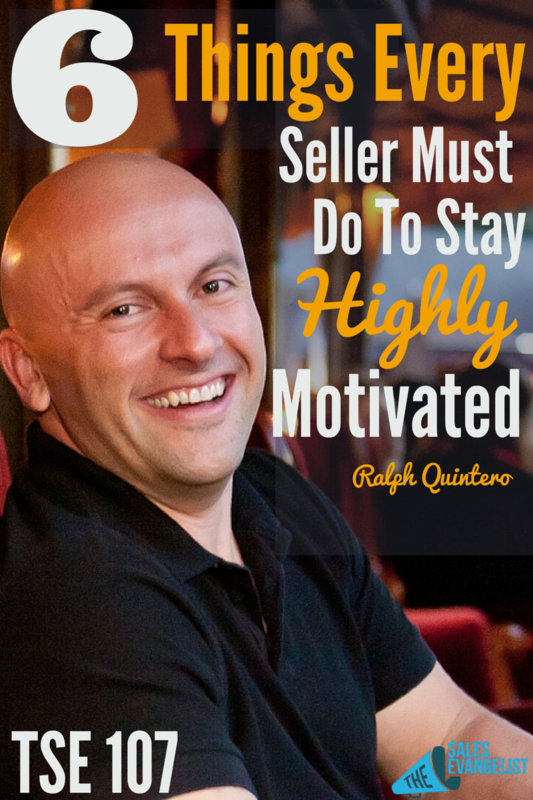 TSE 107: 6 Things Every Seller Must Do To Stay Highly Motivated | The Sales Evangelist! Brace yourself guys! This episode comes with an explosive, wealth of really good, motivating and happy information. 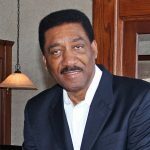 Being his second time on the show, Ralph Quintero talks about the power of storytelling to achieve success in sales, the key aspects or fundamentals of being a good salesperson, turning so-called failures into positive things, surrounding yourself with superstars and so much more. 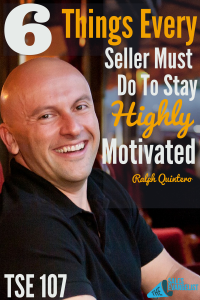 Ralph was my guest on Episode 2 which was one of the most downloaded episodes of The Sales Evangelist podcast. And I am so happy and thrilled to bring back Ralph Quintero who is the genius behind Happy Someone. Ralph’s second best sales experience being the customer: Being sold $1400 set of Cutco knives by a guy who reminded him of me. Stories connect with people emotionally. People don’t really care about what you’re selling or about you. All they care about is how you can help them. If you can do that by connecting with them emotionally through a story, then you’ve got them! 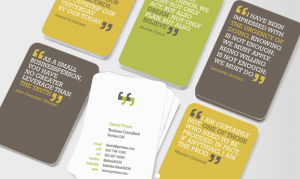 Having “storyteller” as your title on your business card instead of “sales person” on your business card. How Cutco had changed his life. How Cutco has helped him go through school. The impact of purchasing those Cutco knives on him. My funny story behind my Instagram handle @Folgers09: I was in college and one year, I came back home after a semester and worked for a company called CompTec where I sold technical classes. I was making pretty good money plus commission. When I went back to school, I bought a new car, had a new computer and all that stuff. My friend, Jon told me I was like in that rap song by Nelly where he says “I’m like Folgers” (the coffee) “I’m young, black, and rich.” So my friend Jon and everybody in college knew me as Folgers. Knowing your “why” and how it frames things into perspective. Money as motivation vs. your “why”. Start with affirmations every single day to get yourself in the right frame of mind. Read/listen to a motivational book or audio. With 200 of Ralph’s favorite affirmations. You have the option to set your favorites and set a reminder and you get push notification every morning. Doors of opportunity and abundance open to me NOW! New opportunities come easy to me. One tiny little degree makes all of the difference in the world. You may be one degree away from making things happen. Even if you don’t make it, you get pretty close to where you want to go when you set yourself up. It’s not a failure, but another stepping stone to get to where you want to get to. Learning lessons from your failures – What worked? What didn’t work? Do more of what works. Do none of what didn’t work (going forward). Don’t be down on yourself for a long time. Own up to it. It didn’t work. Put the failure aside. Move on to the next thing. Failure and the way you feel about your failure has a lot to do with your ego. Look beyond yourself and your ego. Get rid of the “Negative Nancy’s” by literally running in the other direction as fast as you possibly can. Surround yourself with other motivated and inspired people. Listen to people putting out positive content. Ralph started out his Happy Someone Facebook Community. Life is too short to be around negative people and negative people are going to bring you down. You have the power to make the decision to not be around negative people. Remove yourself from a negative conversation. 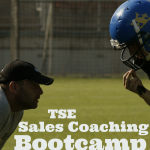 Good salespeople never really have a horrible situation, company or boss. They realize that everything that happens to them is an opportunity to learn and do something better. Celebrate the little things or the little wins every step along the way. Happy Today! Celebrate just because. Focusing on positive stuff = better output on personal life. If you find yourself thinking that you said something negative, stop yourself and rephrase that into something positive. Keep rephrasing it until you get the negative thought off your head. Build a snowball effect of positivity! App Your Biz, A flexible, online platform that allows businesses to take their marketing to a whole new level by allowing them to build their own mobile apps. Option to choose 1 of 8 templates or a blank template. All widget-based: Drag and drop widgets to build your app (Loyalty widget, Social Wall widget, etc). Smart push notification feature – allows you to message anybody who has your app right on the home screen of their device (tips, specials, promos, upcoming events, etc). 79% of people are within reach of their mobile phones for 22 hours a day @RalphQuintero. 80% of consumers will make a purchase via their mobile phones this year alone. 70% of consumers research purchases via mobile. App Your Biz makes it easy and accessible for business owners to have their own app and be able to partake in this mobile movement that is taking over commerce. Connect with Ralph on Twitter @RalphQuintero and Facebook. Find out more about Ralph and the awesome things he’s doing to spread happiness around the world over at www.happysomeone.com. Take massive action. Do big things. Stay motivated. And know what your why is. What is your why? Why do you do what you do?